The Bambisanani Partnership has gained international acclaim for its pioneering work in one of South Africa’s poorest regions, using sport as a catalyst to promote education, health, global citizenship and leadership. This summer has seen the multi-award winning charity take on its most ambitious volunteering project in its twelve year history. Students and staff from St. Mary’s School, Menston, the University of Leeds and Leeds Trinity University have recently returned from South Africa where both individually and collaboratively they extended and developed the work of the partnership. Following eighteen months of preparation, planning and fundraising, sixteen students from St. Mary’s embarked on a mission to deliver a ‘Leadership Through Sport’ programme’ to students at Mnyakanya High School situated in the remote, rural Nkandla area. This year’s visit was led by Catherine Chattoe with support from Brad Dobson and Charlotte Wood. The student team included Olivia Brady, Joe Gardner, Grace Darker, Orla Turnbull, Lily Humphreys, Libby Woffenden, Charlotte Walker, Rhiannon Boardman, Nicholas Brinkworth, Sylvia Cullen, Edward Fieldhouse, Aidan Joyce, Luke Barnes, Maeve Hendron, Lucy Hings and Lily Greenhalgh. Throughout their visit St. Mary’s students were assisted by three students from Eshowe High School; Morgan Gray, Nokabongwa Mtembu and Sbongisiwe Ntuli who supported them with the delivery of the leadership programme and provided valuable assistance with English and Zulu language translation. After four intense days of hockey, netball and rounders coaching, thirty Mnyakanya students were fully equipped and confident enough to organise and host a spectacular Sports and Reading Festival for over 120 children from Ntolwane Primary School. The success of the collaboration between the students from both countries was celebrated with a special presentation ceremony. South African students received leadership awards and annual awards as a way of recognising and celebrating their ability and potential as outstanding leaders. Additionally as part of the visit, the St. Mary’s students delivered lessons in a wide range of curriculum areas. Enthusiastic staff and students from Mnyakanya High School experienced high quality lessons in English, Maths, Geography, Science, Music and Drama. In one lesson Mnyakanya students represented the components of the solar system and moved around the playground as a way of learning how the solar system works. The final part of their visit saw the St. Mary’s students volunteering at uMlalazi Day Centre and Crèche, a centre for AIDS orphans and vulnerable children run by the Zulufadder Children’s Trust. This was a magical time for the St. Mary’s students where they loved bringing stories to life with the use of props and toys and, for the first time, helped with the centre’s gardening project by planting some vegetables. Alongside the St. Mary’s visit, and building on the outstanding work of Andy Lockwood this was the third year of volunteering in South Africa for the University of Leeds. Members of staff Tilly Hall, Tom Exeter and Lisa Naylor led this year’s visit of ten students representing a wide range of degree programmes. Natalie Donohue, Emma Sallis, Georgina Ellis, Charlie Vickers, Ava Martinez-Lambert, Francisca Darko, Aimee Christadoulou, Jessica Hole, Rachael Dickinson and Emily Bowden made up the ‘Gryphons Abroad’ team that successfully delivered two major projects over the two week period: Cycling for Success and Inspire through Sport and Leadership. Both of these projects were also supported by three students from Leeds Trinity University, namely Oorjitha Prem, Danielle Lawrance and Katherine Skelton. 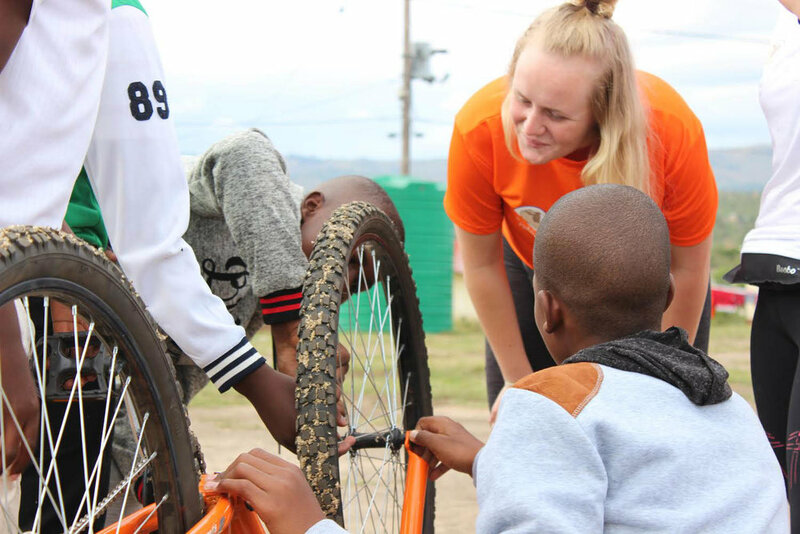 The Cycling for Success programme was based at Mnyakanya High School where the team taught a group of thirty students how to ride and maintain bikes. By the end of the week all students could ride a bike, most of whom had never been on a bike before and nine students had all the skills and knowledge of road signalling to cycle on the main road. The skills the students have learnt are invaluable and many of them have already used the bikes to get to and from school, which for some was previously a two hour walk each way. The South Africa school teachers also spoke about the impact of the project on the students’ motivation, confidence and desire to succeed, and how the bikes were being used in the community. 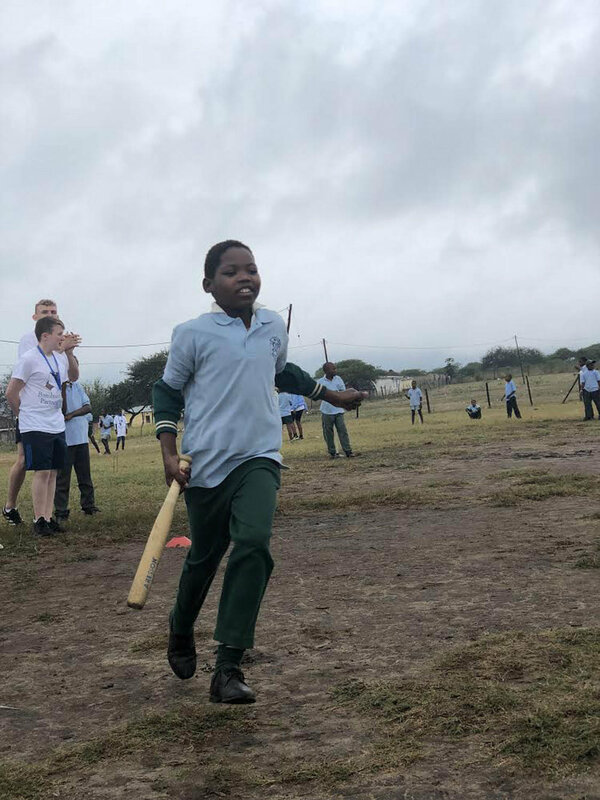 The second week of the visit saw the students from the two Leeds Universities lead the Inspire through Sport and Leadership programme to over 160 primary school children from the town of Eshowe. Through a range of sporting activities and challenges, the primary students learnt a range of leadership skills based on communication, organisation and planning. This work culminated in the children themselves taking responsibility for leading sports sessions. The Gryphons Abroad team also led a classroom sessions based around their degrees, where subjects as diverse as Maths and Mental Health were taught. In the Bambisanani spirit of ‘Working Together and Learning Together’ the University of Leeds team made a major contribution to this year’s programme by supporting staff and students from Leeds Trinity University who were making their first student visit to South Africa as part of the Bambisanani Partnership. Led by members of staff Dr Chirs Rowley and Dr Nicola Arjomandkhah, seven students from Leeds Trinity University (LTU) travelled to KwaZulu-Natal, as part of the university’s landmark inaugural International Volunteering visit to the region as part of the Bambisanani Partnership. Oorjitha Prem, Danielle Lawrance and Katherine Skelton accompanied the Gryphons Abroad team in the delivery of the aforementioned Cycling for Success and Inspire through Sport and Leadership projects. This first collaboration of its kind between students and staff from the two universities was a great success, representing an exciting avenue for future combined work in the region. Alongside these projects, four LTU Primary Education students spent their time in two South African schools as part of their ‘alternative teaching placement’ module. Amy James, Beth Ward, Hannah Page and Harriet Mackinney joined the university travelling party, with a view to extending the successful work of the Bambisanani Partnership into some of the Primary Schools within the KwaZulu-Natal region. Week one saw the students work across grades four to seven in Ntolwane Primary School in Nkandla, with class sizes averaging around 70 to 100 pupils. A range of subject areas were covered, including Geography, Maths, Physical Education and English, with the ‘Premier Skills’ resources (developed by the British Council in partnership with the Premier League) proving to be particularly useful in facilitating the delivery of English language lessons to Zulu natives. In week two the students were then allocated a specific grade to teach at John Wesley Primary School in Eshowe, presenting an opportunity to work alongside local teaching staff, and to learn more about the country’s education system and culture. Older PostPlease sponsor Alessandra Valle-Metaxas in the GNR!